All joking aside, are car manufacturers making their cars more disposable nowadays? Ronny monologues about the worst cars to maintain. Beka wonders why car companies only focus on churning out new cars. Mickey explains to us why he has ants in his pants. And just in case you don’t know, Grimace is the big, purple character that McDonalds used to have. Also, grimace means to frown. See what we did there? Another business trip, another airport, another rental car. Arriving in Cleveland on a sunny but cool day, I did the usual thing of running my eyes up and down the row of available cars, trying to choose one I’ll like. Compact SUVs, minivans, dull sedans…Oh hey, there’s a Camaro! A shiny, white hardtop version sat before me, looking inviting. First question: will my gear fit? A moment later I knew that it would, although the big Pelican case just barely slipped through the opening. The trunk itself is spacious enough, but be warned that large items may not make it inside. I didn’t have far to go, but it was enough to tell if I would like this car. My customer was about an hour from Cleveland and my hotel was half an hour from my customer, and I had two days with the customer then home the third day. Not enough time for a full review, but I’d definitely have enough time with the Camaro to get an impression of it. So what did I think? Read on, intrepid car-fan! First impression: It’s a bit claustrophobic inside. Not cramped by any means -unless you try to get in the back seat- but the black interiour surfaces coupled with high, small windows, makes for a feeling of being very contained. Most of the controls are easy. The temperature controls were a bit less intuitive but it didn’t take me long to figure them out, and in fact once I did, I had to admit that they were rather clever in terms of avoiding clutter: the chrome trim-rings around the two central vents double as the knobs to control the temperature and fan-speed. Give them a twist to adjust, and small LED displays next to them will show you the results. The ergonomics are good, even for my big tall physique, but between the small windows and high, dark dashboard, I definitely felt like I was sitting way down low, more so than revealed to be true when getting in and out. With all the usual adjustments made, I was down the road. 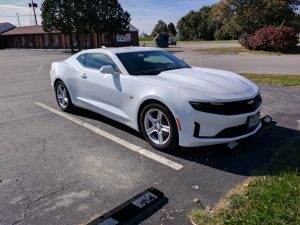 I’ll admit that I gave it a throttle-punch before I was actually on the public road, as there’s a long drive around the rental car center to get to the road, and the Camaro gave me a taste of what was to come. Its engine makes a fun growl, not too loud but no doubt groomed through careful application of acoustic engineering and judiciously-placed resonators, enough to be interesting without becoming an onerous drone after too long behind the wheel. The acceleration was good too- clearly not a high-performance variant, since you never get those in rental fleets, but definitely sufficent to give you some grins. Enjoyable handling too- no issues with traction, and the torque was pretty much where I wanted it and being rear wheel drive, did not result in any directional instability. At freeway speed, the Camaro is easy to drive but does require a little bit of attention as the steering is just a bit quicker than most cars. Braking is quite good too, as I learned when I saw an old car that needed to be photographed after a quick U-turn. Everything works as it should. But there’s no escape from the claustrophobic impression, even in broad daylight, as the windows all seem barely better than gun-slits and the rear quarter windows are so small and the trim around them so deep as to make them completely useless and pointless in every regard except for maintaining a passing resemblance to the first Camaros of the late 1960s. But no worries; the car is still fun enough to take your mind off the poor outward visibility and you do get used to it. There aren’t a lot of curves in Northern Ohio, and barely anything that registers as a hill- so I couldn’t get too crazy with the Camaro, but it told me enough via the posteriour-trouser interface to make me wish that there had been some more interesting geography around. But in this easy type of surroundings, this is car that you can easily guide over the countryside all day long. It’s easily maneuverable, responds well, and doesn’t ask too much of the driver at a moderate pace, and it’s not difficult to keep on top of when things gets a little more spirited. Of course the inevitable question comes up: how does it compare to the Mustang? I recently drove a few Mustang convertibles, so it was easy to draw some conclusions. Let’s get that poor visibility out of the way first. Even with the limited windows of the raised convertible top, the Mustang is still easier to see out of. Ergonomics are a draw, at least for me. Cargo space -as if you really cared, in cars like this- is about even. The Camaro definitely sounds better. Another advantage I give the Camaro is that it has a LOT fewer menus and settings to figure out. It has a mere three driving modes (each easy to understand the use of), as opposed to the four or five basic modes in the Mustang, followed by two or three more each for the steering and transmission. The Camaro has livelier acceleration. On paper it seems like the better car, but in real life it’s more subjective. The Mustang still FEELS better overall to me, and if I could have it with the Camaro’s engine, I’d seriously consider never taking it back to the airport. If you have a chance to try a Camaro, go for it. This is a car that has come a very long way in fifty years, and its hiatus from 2002 to 2010 was worth the wait for what came after. I definitely recommend it. The news that Ford will be discontinuing all of its cars (as opposed to SUVs and trucks) except the Mustang came as a bit of a shock, even if it was fairly common knowledge that they weren’t exactly strong sellers. And to me it’s a sad sign of the market drifting into a state of decreasing diversity of choices, both in individual models and general types of cars. I’ll admit that I couldn’t remember the exact cutoff-date for Ford cars (all gone by 2020), but I thought of it recently during another rental car experience. This wasn’t another of my frequent business-trips, for once. This time it was a vacation with my wife Jennifer up in scenic and charming Spokane Washington, where she has roots on both sides of her family. Spokane’s airport is on the small side, so instead of picking any car from the aisle as usual, the rental clerk listed a handful of available cars from which to choose. Nothing unusually nice available -I was hoping they’d see my status and give me a Cadillac or sump’n- but when I heard Ford Fusion in the list, I recalled how much I’d enjoyed the ones I’d had in my biz-travels (see my Rental Car Review, Dec 2017) and went for it, wondering if it would be the last one I ever drove. The Fusion was a great choice for us on this trip. In previous trips to Spokane we’d had a Fiat and a Hyundai, neither of which dealt well with the rough, frost-heaved pavement prevalent in much of the city. 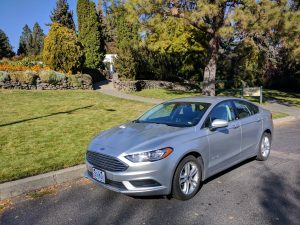 While it doesn’t ride quite as smoothly as a Cadillac, the Fusion was smooth enough that only the very worst of the pavement caused us any discomfort. The hybrid powertrain also meant minimal fuel consumption, always a bonus when you’re on vacation. We drove around constantly all over town, and even made a trip to Coeur d’Alene Idaho- and only used half a tank in six days. Speaking of the hybrid experience, Jennifer found it a bit strange at first- she described how weird it feels for a car that isn’t making any sound or vibration to be rolling, especially if it wasn’t going downhill. Weirder still, unless you’re listening for it, you don’t notice when the gasoline engine starts and stops. Everything about it is just S-M-O-O-T-H. The Fusion is easy to drive, but I did sometimes find myself turning the gear-knob the wrong way during moments of close maneuvers. And during those quiet, smooth moments off the line, the calmness of the whole experience makes you want to drive calmly- mostly a good thing, but you might find yourself driving a little too slowly at moments. Honestly, the Fusion was the perfect car for a vacation. Smooth, unobtrusive, minimal effort required, comfy, it would be a great car for every day use as well. I’ve enjoyed every one of them that I’ve driven, and I’ll honestly be sad to see them go from the Ford lineup. And I was sad to see this one go at the airport. Goodbye, Fusion.